Be the first to share your favorite memory, photo or story of Brandon. This memorial page is dedicated for family, friends and future generations to celebrate the life of their loved one. 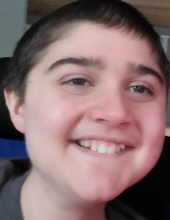 Brandon Jackson Ballew, age 22, of Duluth, Georgia, passed away on Friday, April 12, 2019. The family will receive friends on Monday, April 15, 2019, from 10:00 am to 12:00 pm at Crowell Brothers Funeral Homes & Crematory Buford Chapel, with a funeral service following at 12:00 pm. A graveside service will be held on Monday, April 15, 2019, at 4:00 pm at Salem Baptist Church #2 Cemetery in Mineral Bluff, Georgia. Brandon was a kind soul who always greeted you with a smile. He had a passion for animals, video gaming, and spending time with his brother. Although he fought multiple illnesses during his short lifetime, he never complained about his condition. He was always optimistic, brave, and forward-looking- a true fighter until the end. He is survived by his father Tim Ballew; his mother Alisha Harvill Cafferty; and his older brother, Tyler Ballew. While Brandon’s loss is felt deeply by the ones he loved, his sweet spirit will endure in our hearts until we are united again for eternity. Brandon always said, “I love you more!” And he meant it. To send flowers or a remembrance gift to the family of Brandon Jackson Ballew, please visit our Tribute Store. "Email Address" would like to share the life celebration of Brandon Jackson Ballew. Click on the "link" to go to share a favorite memory or leave a condolence message for the family.